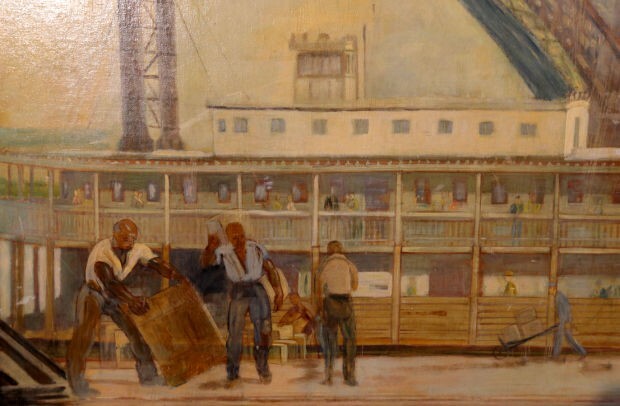 Commerce on the Landing has been rehung inside the Grand Hall at St. Louis Union Station! 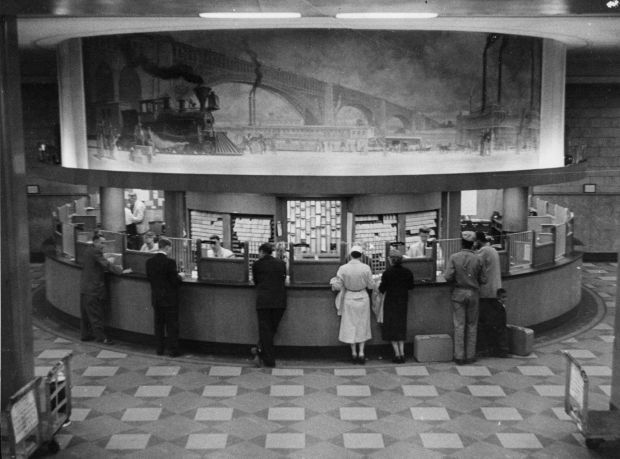 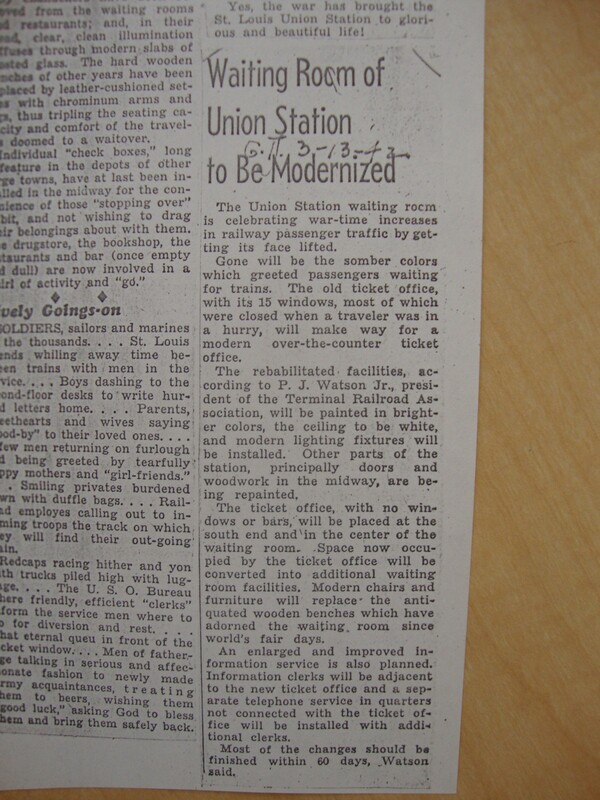 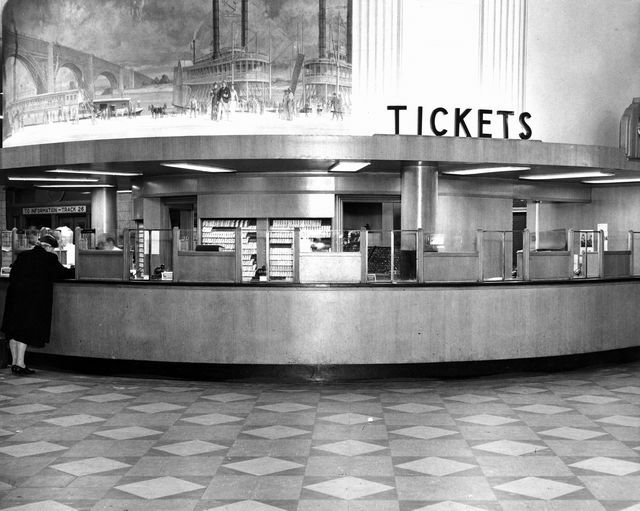 Grell was commissioned to paint a unique seven foot tall by twenty-eight foot long mural to be mounted above the curved “new ticket counter” as part of the World War II renovation at Union Station in St. Louis in 1942. 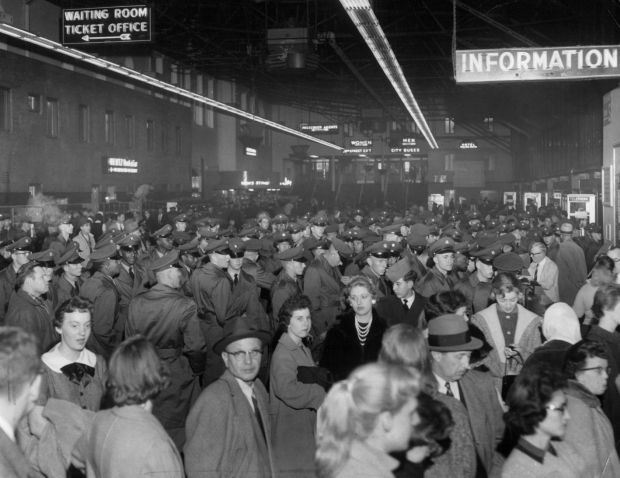 More than 100,000 passengers used the terminal daily during the height of the war. 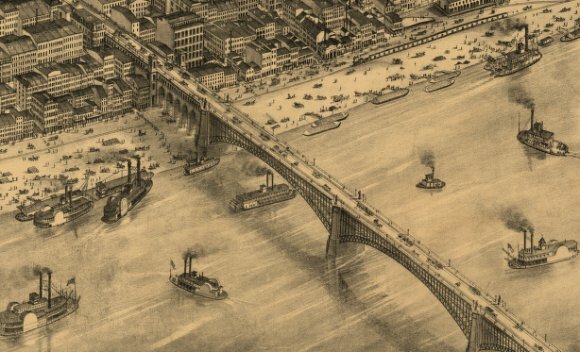 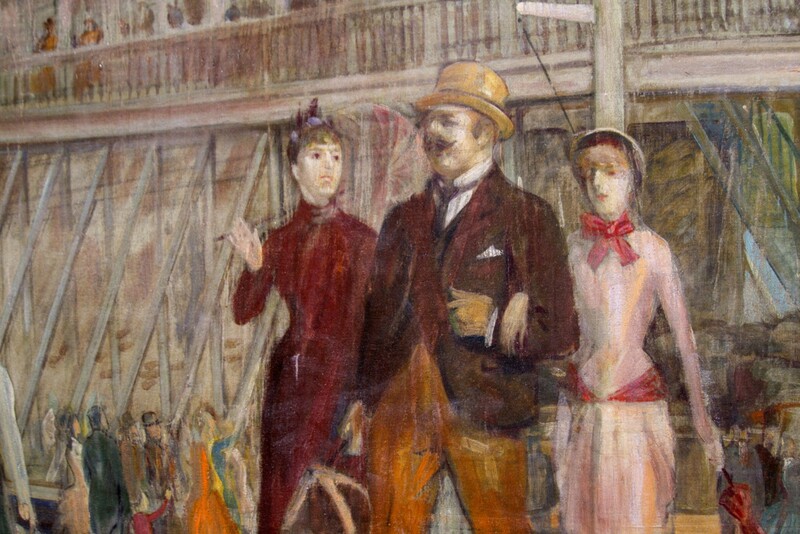 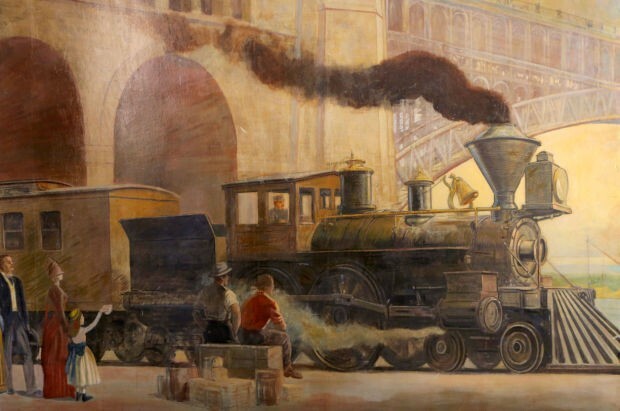 The St. Louis Union Station terminal was the “busiest passenger rail terminal in the world.” This historic mural titled Commerce on the Landing, depicts the Eades Bridge, Mississippi River front, 2 mighty Steam Boats and an old fashioned steam engine train on the riverfront during the 1880’s. 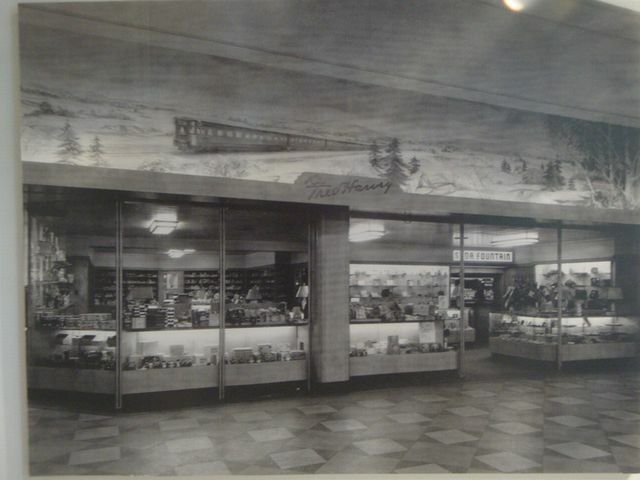 The mural was officially unveiled in June 1942. 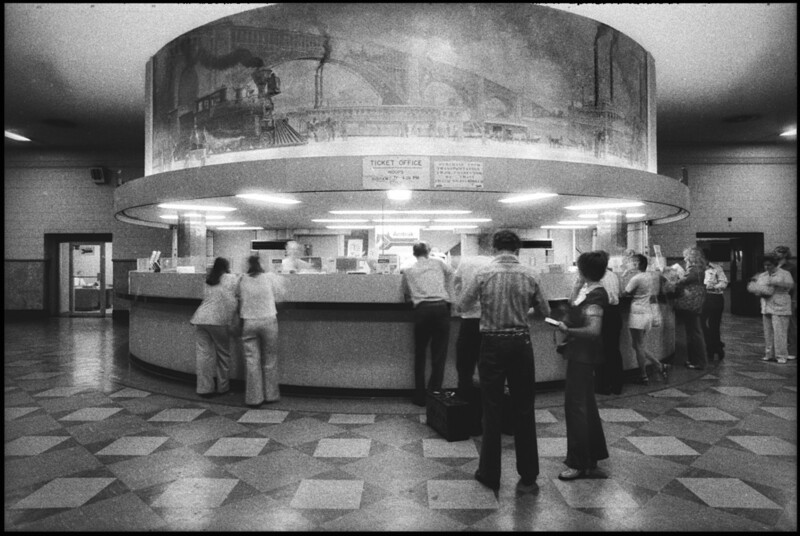 The mural was in place until c1985, when, during an extensive renovation it was moved to the UNION STATION Cine 10 theatre for a short period until the theatre closed and the mural was lost. 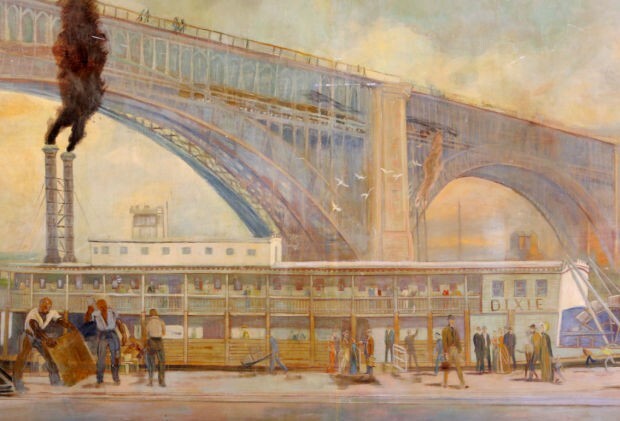 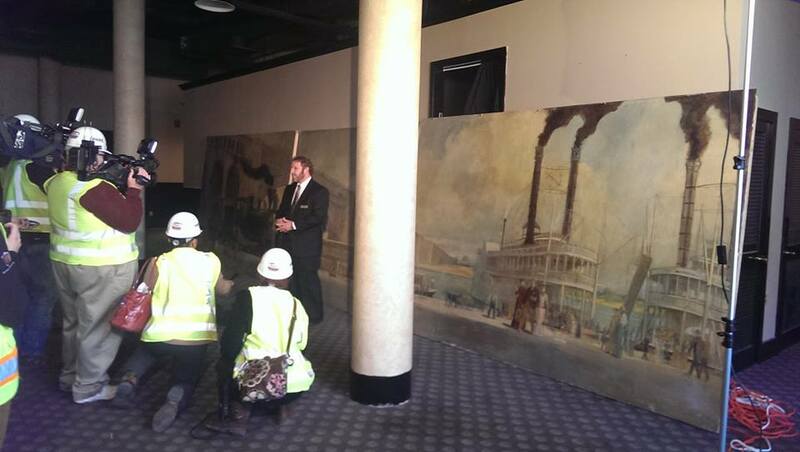 This mural was rediscovered in March 2014 by employees during a $66 million renovation of the hotel and terminal. 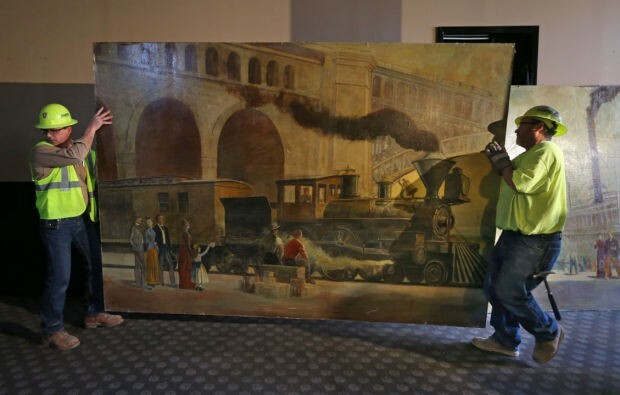 Please see color pictures of the newly rediscovered mural above. 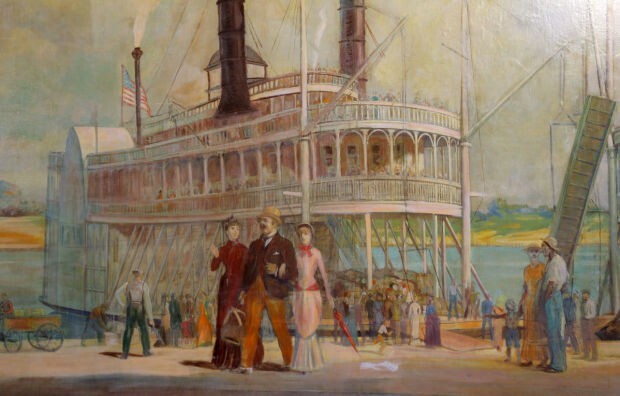 Notice the Impressionist style used by Grell for this particular commission. 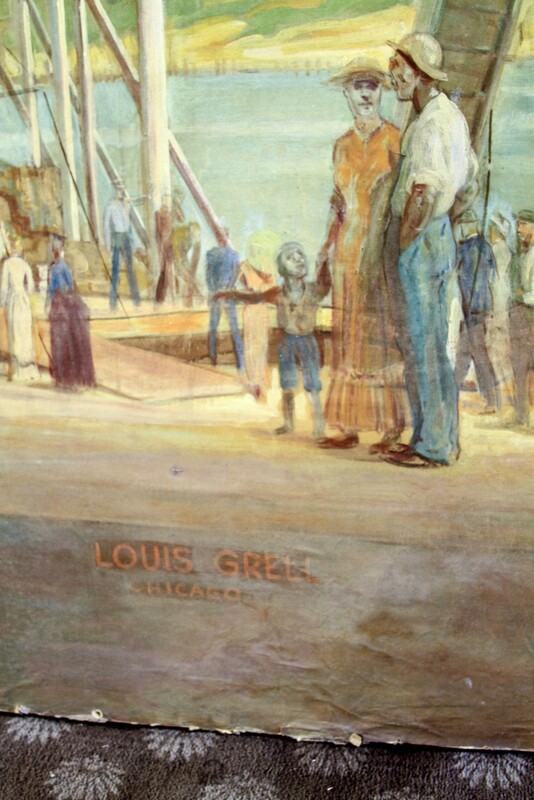 Versatility by Grell was common. 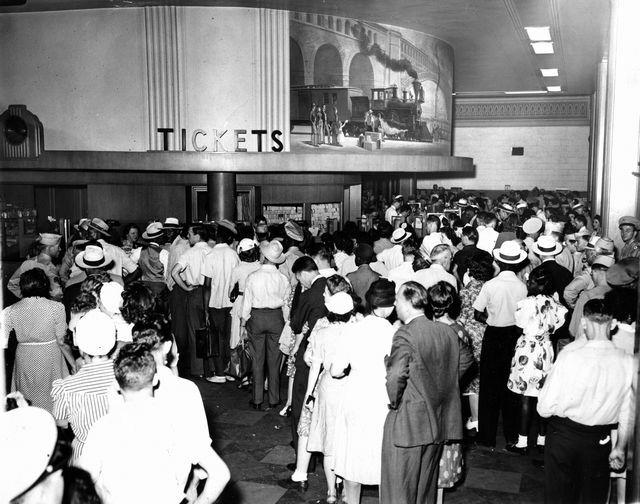 Many news agencies covered the discovery from St. Louis to Indiana, Illinois, many across Missouri, the Washington Times, the New York Post and the San Francisco Gate all ran extensive stories and links to the video covering the great find during a time when great art discoveries are being well represented in Hollywood films such as the Monuments Men. 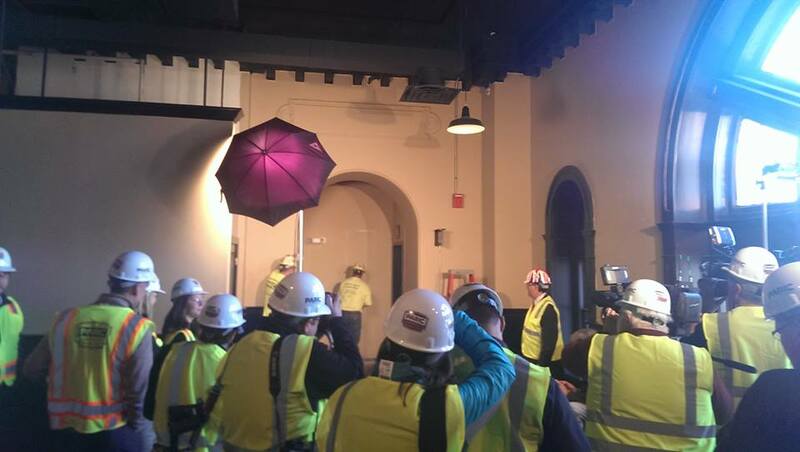 Many THANKS to Joe Hartness and the Harrick Group of Chicago who have lead the design team during this renovation and his relentless pursuit in finding the mural. 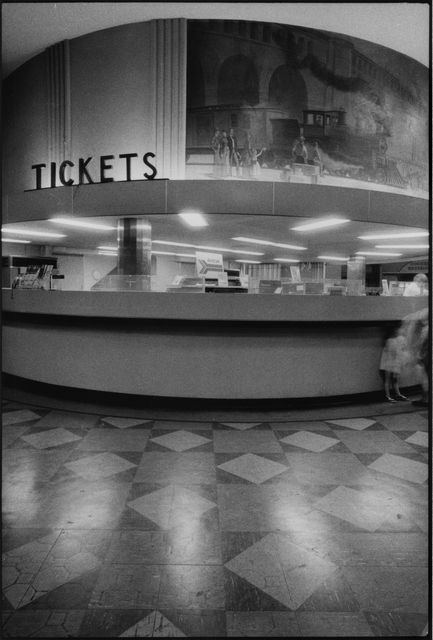 UPDATE – HUGE THANKS to Leslie Heinrichs of the Marcus Theatre Corporation who shared there discovery of two images from June, 1988 of the former Union Station 10 CINE operated by Wehrenberg Theatres. 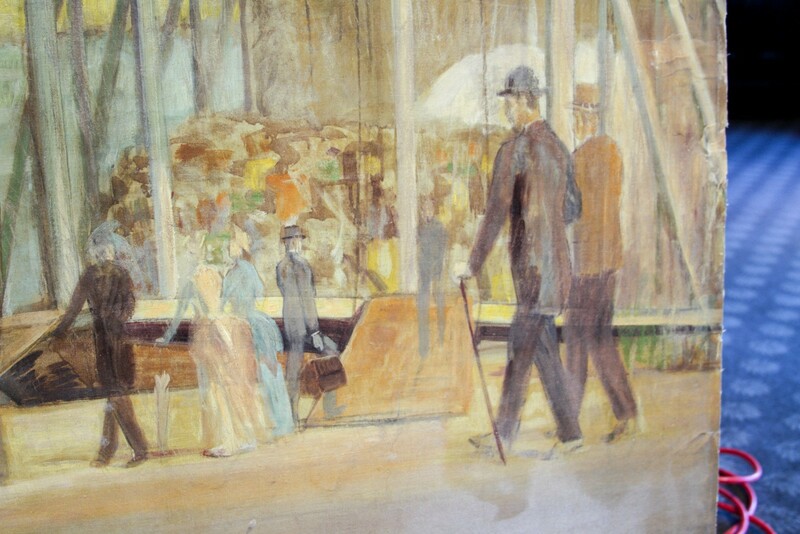 A beautiful view of the exterior and one of the lobby showing Louis mural. 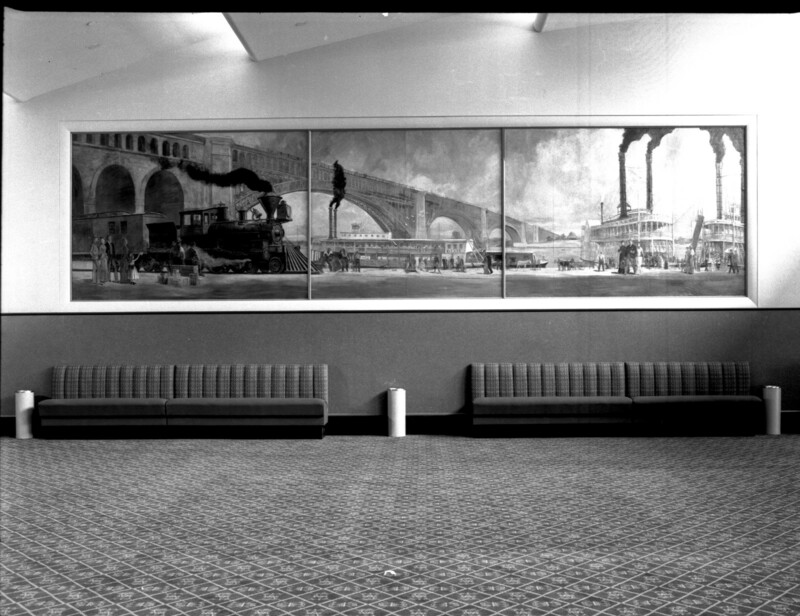 Some time shortly after this photo was taken, the mural was put into storage and forgotten until rediscovered in 2014.
two 1988 b/w photos at 10 CINE courtesy of the Marcus Corporation Archives. 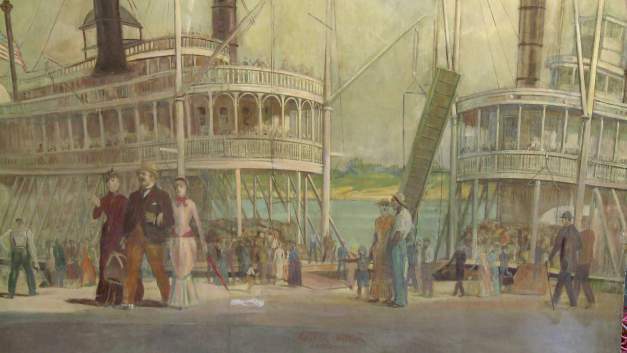 Many thanks to all those who joined us on October 29, 2015 for the gala re-unveiling and art exhibit opening night festivities.